Quality Management fully DETERMINES to apply quality mangent policy. then all stuff FOLLOWS the writen method. There are 8 (eight) Quality direction. Quality persons are working necessary section as per the quality assurance need under the 8 quality director. Setting quality standards for service based on buyers requirements. Ensuring necessary systems processes and processes and procedures in place to meet the standard at every stage of our service. Training and equipping our manager and employees and employees to use these systems, processes and procedures effectively. Seeking continuous improvements in all stage of operation. Ensuring our external partners (sub- contract auditions and experts) is committed to the achievement of our quality objectives. Promptly attending to all complaints on service quality and taking speedy remedial action and elimination the possibilities of its recurrence. fabric shall check to find out the Fabric QTY. Country wise shade counting card. Fabric supply to cutting as per requisition. Delivery or issuing to various section. Inventory report & swatch card preparation. Preparation final packing list of excess fabric, accessories. Shifting of close down P.O & remark to dead store. To identify and determine the extent of fabric defects, the different width and accurate length of the fabric. The fabric inspector is responsible to carry fabric inspection to maintain inspector record. Quality Assurance manager is responsible to approve the inspection result and decides in case of a non-conforming fabric. 8” x 8” fabric swatch from all rolls of each color received in a lot are cut the rill number on every swatch are recorded. These swatches are sewed together in form of a blanket and among these swatches one is send for wash as per buyer washing standard. The Shade Mat Cart is recorded recording roll number in every shade identified in a color in every lot. The roll of fabric is uploaded on fabric Inspection Machine and the width of the fabric is measured in various position and the data is recorded. At the same time inspection is continued against the 4 point system. For the inspection, a sample of minimum of 10% of the total fabric covering each color all the different fabric dye lots and different width of fabric is taken. The defect the Identify are as follows:- Hole, Fly, contamination, Slub, Stripe, Lycra out, oil mark, vertical mark. In consumer production Ltd there is a particular rule to inspect the incoming fabric. The rule is known as Four Point System. II. The roll of fabric is uploaded on Fabric Inspection Machines and the width of the fabric is measured in various positions and the date is recorded. At the same time inspection is continued against the 4-point system. To check the shade of various positions of the rolls fabric panels are from starting end of the rolls and the different color tones are separated for systematic operation of the order. III. For the inspection, a sample of minimum of the 10% of the total fabric covering each color, all the different fabric dye lots and different width of fabric is taken. IV. The inspection is carried out as per the sample displayed. e.g. slab, colored yarn, missing yarn, etc. To ensure the color wise shrinkage of the fabric, a swatch 1 yd in length of every color and quality of fabric in a lot using calibrated measuring tape is cut and washed against the washing standard. .The shrinkage % is calculated using the following formula. 36= % Shrinkage of length. To ensure whether the color of fabric of fabric of each dye lot should bleed or not and three by get approved from lab dept of the buyer representative. It is done through two of test 1) Rubbing test & 2) Color Fastness test to wash.The Executive . lab-dip is responsible to perform the test. A Quality Controller assists him to the test. For Ribbing test, these panels are tested in croch meter (Dry and Wet) using gray fiber. Incase of failure the supplier of the fabric is noticed and taken necessary steps the consultancy of the buyer representative. For color Fastness test to wash cut panels are washed against buyer’s standard along with multi fiber. It deter mines whether this fabric can be washed with other fabrics or not, of can, what are the properties of those fabrics. Pocketing- T/C Pocketing in match color. Zipper- YKK # 4 YG metal zipper. Other Information- PLS follow the inquire pattern is very urgent. PROTO, PCR, P.P.R, F.C.R, Size set, Pilot Run etc provided from here. To determine identify and control cutting defects that are found during the marker making and cutting process. The responsibilities of the Quality Control in Charge implements the Cutting Quality Control System and verifies the Cutting Quality Control Report. The Cutting Quality Controllers are responsible for carrying out the cutting inspection and maintaining the inspection reports. The hand patterns are checked against buyer-approved patterns. If the pattern is in 100% conformity with the size spec, the quality controller will put the hard pattern sealed and sign it. If any fault-cut and ragged cutting defect is found the QC inspector will inform the Quality Assurance Manager who decides whether the defect can be corrected or not. For other faults QC inspector directly informs the Cutting Manager. For correction the Cutting Manager is informed and the bundle is re-checked after re-work. The result are recorded in Cutting Quality Report. If any major defects are found, the defective part must be replaced from fabric of that particular roll. The hard pattern has to be checked against the Marker Pattern to ensure that the Marker Pattern is Correct. To check the notch location by placing the pattern over the top and bottom ply. The notch should not be more that +/- 1/8-inch. If so, the cutting quality controller has to discuss the same with the cutting supervisor. The cut checked against the top and bottom ply. Then both the top and bottom ply are checked against the hard paper pattern to ensure cutting accuracy. Maximum tolerance is +/- 1/8 inch. Io ensure there is no problem, the cutter must split the Marker line to avoid further problems. Maximum tolerance allowed is +/- 1/8 inch. Ragged Cutting is parts that cannot be used for production. All ragged cutting parts should be replaced before issuing to the production line. To ensure that defects which are found during the fabric spreading are segregated. Quality Controller, Cutting Section is responsible to verify the Spreading Quality Control inspection. Spreading Quality Inspector’s responsibility is to carry out the inspection the fabric layers and to maintain the inspection report. If any splice, narrow goods, tension leaning and shading faults is found the inspector stops the spreading and informs Quality Manager. The QA manager inspects the faults and records his decision on. The cutting Manager will take necessary corrective action after which the spreading is inspected again. The spreading quality inspector’s report is approved by Quality Manager and is given cutting manager. 100% of the fabric layers are checked during the fabric spreading against the defect mentioned bellow and recorded the observation on the spreading quality control reports. After completion of spread, check splice laps to see that both splice extend passed the splice mark by no less than half inch & no more than one inch. After completion of the spread, check the “Far Edge” of the spread to see that all plies extend beyond the marker line. Check the Tension during spreading. This is very important on knit fabric. To verify the count after the completion of spreading, and before cutting, a count all plied must be taken at both ends. There is no tolerance. To check carefully and to ensure that one edge of the fabric is aligned with the tabletop. All kind of fabric defects, fabric defects are identified using arrow sticker. The QC has to check both end of fabric layers to ascertain whether is straight or not. To check that the marker is placed on the spread with the edge parallel to the salvage of the piece goods. To verify that all cut pieces will be complete. To check for shading. Unless all parts are ply marked, it is essential to have a system to control shading. To check for table marks as the table is marked. Allow no minus tolerance for the splices. For marker, count check, fabric faults, ends, marker placement and table mark faults the spreading QC stops the spreading process and asks cutting dept. to take corrective actions. The Company has export process checkers in their sewing who were checking 100% of the import process. So the factory has skill sewing operator, who can prepare fast class export quality dress. Inspection – Stitch designing for work man ship. To ensure the fabric properly fused and meet the buyer specification. Quality Assurance Manager is responsible to set temperature, speed and pressure standard and Fusing Quality Inspector is responsible to monitor and record the results. Set the fusing Machine according to quality of fabric and fusing. The QA Manager checks fusing quality, the bonding strength and there are not born marks or bubble on fabric. If the result is OK the QA Manager approves the standard of temperature pressure and speed for a particular fabric and gives approval for bulk production. Line Chief and Line supervisor are responsible for make the size set under the supervision of Quality Controller and APM with correct seam allowance. Following the customer instruction and approval sample with correct seam allowance make the size ser. After stitching finished garments by Q.C Supervisor will take the before wash measurement using calibrate measuring tape and record on the Measurement Chart Fit Audit. After that it is sent to the washing section to wash the garment as per buyer washing standard. After wash the Q.C Supervisor will get the finishing work done as per customer inspection. The Q.C Manager checks the Measurement using calibrated measuring tape and record after was measurement on the Measurement Chart Fit Audit. Based on the shrinkage result the Q.C Manager advice pattern master to adjust pattern (if required) and gives approval for test cut. To ensure the quality of the garments and to identify the defects if there any and rectify those if possible. 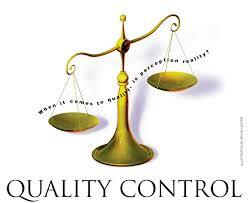 Quality Controller is responsible for implementation of final inspection system and verifies the inspection. The garments are inspected from inside and outside for stitching defects as explained in Sewing Defect Standard. Using Arrow Stickers identifies defect and the defected garments are segregated. The Results are recorded on table on table Alteration report. On hourly basis Quality Controller will verify the final Table Quality Inspection by re checking the segregated defected garments on random basis and sign to Table alteration Report. Once the in line Q C Controller have verified the Line Supervisor will take the defected garments for repair, and there are re-inspected with normal production. End of the day Quality Inspector will calculate the defect percentage for every line and record on Table alteration Report. 1) To take the out put of sewing section. 2) Bar take and hole. To ensure that the garment is fully free from ferrous or broken parts of a needle. The needle detector machine operator is responsible for carrying out the operation.  The garments Okayed in preliminary inspection are passed through the machine.  The machine determines whether the garments contain the any ferrous components or not.  Of a garment contents any ferrous item or broken needle, the garment will fail and the fail garments are kept in reject box for needle detector machine.  The machine is calibrated in every hour.  The passed garments are kept to the quarantine area until next calibration is taken place.  Results are recorded on the needle detector sheet and respective calibration sheet. To ensure the quality level of the garments which are going to be packed? Quality person check the accurate barcode as per the deferent style and other information which is hidden in the Barcode. To ensure Quality & the Measurement of the final inspected garments according to buyer’s standard. Quality Assurance Manager is responsible for the implementation of Final Quality Audit & Verifies the Final Quality Audit Report.  On hourly bases final audition carries out the final audit of every style of packed garments.  The audit is conducted following 1.5 AQL Standard (Major) 4 AQL Standard (Minor). During the audit the final audition inspect the garment measurement, stitching defects, finishing defects and accessories, packing, cartoons etc.  If the audit result shows that the lot is within the acceptable defect level the lot is passed for final packing. Results are recorded on Final Audit Report. To ensure that the quality of the packed garments is according to the buyer’s requirement. The quality assurance manager is responsible for the implementation of the final inspection system & the inspection report. From each carton garments are randomly selected. Selected garments are checked against buyer’s specification. If the inspection fails the whole lot is re-inspected. All these procedure is done against AQL 1.5 System.